Neyyattinkara Vasudevan was born in 1940 in humble surroundings and after finishing his high school studies, his ardent love towards Carnatic music prompted him to join the Swathi Thirunal Music College at Thiruvananthapuram. He passed Ganabhushanam in 1960 and Sangeetha Vidwan in 1962 with colours. His skills were honed in the College by a bunch of reputed musicians under the leadership of the illustrious Semmangudi Sreenivasa Iyer. Later Vasudevan imbibed the esoteric subtleties from a rigorous training meted out by Ramnad Krishnan in Chennai. Vasudevan's career graph soared upwards with his arrival to Tripunithura to serve as Assistant Professor in RLV College of music there. This hoary royal town has ever provided a fecund soil for any aspiring musician to bloom and Vasudevan was no exception. With his charming disposition and a positive approach to his chosen vocation, he became immensely popular. In 1974, he joined the All India Radio, Trivandrum as 'A Grade' Staff artist in Vocal Music from where he retired in 2000. The AIR honoured him with 'A Top Rank' - the highest rank in Carnatic Classical Music. His strict adherence to tradition and yet innovating within it, unique style of raga elaboration, inimitable style of rendering rakthi ragas, rendering of compositions in appropriate tempo, compact swaraprasthara and above all his capacity to build up a rapport with the accompanying artists as well as his listeners brought him encomiums even in a place like Chennai where the audiences are fastidious by nature. When he secured the prize for the best sub-junior vocalist in 1971, at the Music Academy, roaring reviews had appeared in the leading newspapers. Vasudevan's gift for voice modulations and flourishes are always enviable. He comes out always with a clean diction and his format during a concert is evenly distributed among our Sahajavaggeyakaras. He took a lot of pains in popularising, Swathi Thirunal compositions throughout the country and abroad. An hour of music of the accomplished musician, in connection with his birth anniversary on Dec 25. 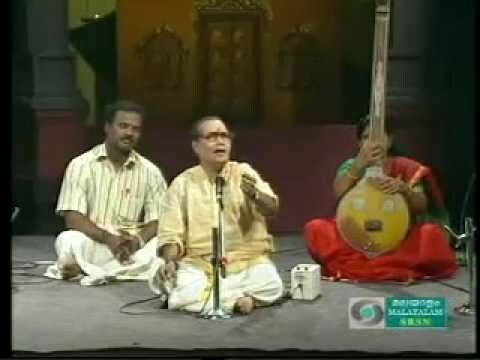 A concert by Neyyattinkara Vasudevan. Music of the accomplished musician from Kerala in connection with his death anniversary on May 13.